I am very sad to pass along the news that Brando, our senior,very handsome, lumpy and quirky special needs boy passed away this evening. For those of you that didn't know Brando (and his girlfriend Violet), Brando came to us on November 20, 2010. Brando's rescue is one that I frequently recount when telling people about how some shelters "get it", care about the animals and work well with rescue groups. I received a message that day from Eric at SFACC (he's the Animal Care Supervisor at San Francisco Animal Care and Control.) The message was about an old, sick bunny who had just been owner surrendered as a euthanasia request. The list of ailments went on and on...the bunny was morbidly obese, had a broken leg, had a massive hernia, had syphilis ( turned out to be rectal polyps instead), had suffered a stroke or had seizures, etc etc. AND, the bunny was 9 years old. However, this is the touching part...Eric said that he felt the bunny still wanted to be here and wasn't ready to die yet, so he called asking if we wanted to take him into rescue. After such a "delightful" list of ailments, who could resist?! We went and got him right away. I don't remember at this point who did the transport, but thank you. We named him Brando after Marlon Brando because I have a warped sense of humor. Despite his girth, the lady bunnies loved Brando. He was so fat at over 7 pounds that he looked like a starfish. He couldn't walk or hop. He was a mess from top to bottom, but sweet and happy as could be. He went on the SaveABunny boot camp diet and weighed in a few months later at a healthy 4.5 pounds! He learned to hop again and we found him a girlfriend,Violet, also a special needs bunny. They fell completely in love and took loving care of each other. A few weeks ago Brando and Violet went into a foster home with a vet tech who ADORED them. On Monday, we received a call that Brando was having regular , major seizures and was not doing well. The foster person was out of town, but the pet sitter was an experienced rabbit caregiver who gave Brando all the right meds and even slept with him at night. We received an emergency call today that Brando was not eating and declining and Dr. Scheenstra had suggested that Brando and Violet come back here ASAP. It was too late though and Brando died on his way over here. It's just very sad to watch such an animated, little guy not be here anymore. Violet seems to be doing fine and I will likely try to pair her again as soon as possible. The foster person may want to take her back, we'll see. Brando will go to Marin Humane Society tomorrow for a private cremation. I just wanted to make sure to thank Eric at SFACC again for saving this little guy and thanks to Lisa H, Francesca, Rob and those of you who tenderly gave Brando his "special" bath when he needed it most. We'll really miss this memorable little guy and his funny little hops. Violet is now back at SaveABunny after an extended stay at her foster home. She is such a happy,positive girl and now she is even happier because she is in LOVE! Brando (gray and white senior, neutered Dutch bunny)is one of the most attentive, gentle and adorable little bunny souls you'll ever meet. His story is so sweet and touching and shows that no matter how bad things may seem in the moment, joy and happiness may be just around the corner. Brando was surrendered to San Francisco Animal Care and Control by a family that could no longer care for him, so they requested euthanasia. At that time Brando was sort of a mess. He was a grossly obese, 9 years old rabbit with a variety of ailments. He was so fat that he could barely move and he couldn't clean himself. We really want to give credit to Eric at San Francisco Animal Care and Control for saving Brando's life, because Eric called us to meet Brando as a rescue prospect, rather than just euthanizing him. Eric said. "He just seemed like a happy bunny guy who has had a rough time, but isn't ready to go yet." Brando came to SaveABunny and quickly blossomed with the love and healing he gets here. He's lost weight, hops around on his own, gives bunny kisses and best of all is a devoted partner to Violet. This is a truly a feel good story! Sometimes people wonder why we work so hard to rescue special needs bunnies and this is an example of why. These two bunnies will always feel safety, love and happiness until they pass and that is what we believe rescue is all about. Violet continues to make slow but steady progress. Although still a long way from full use, her right hind leg is becoming stronger, and she can use it to help propel herself along while leaning her right side against something. She's also now able to position both hind legs almost completely under her body when sitting, allowing her to keep cleaner and dryer, plus it's easier for her to eat from her pellet bowl and drink from her water crock. She can also now position herself on her left hip for short periods of time, something that wasn't possible before. This is a big help as it allows her to groom areas that she can't otherwise reach - and she's very fastidious about grooming! When she's given her daily outside playtime, the top of a Marchioro cage is placed over her. It allows a lot of room for her to move around and munch on the grass while giving her something to lean against. She's still very sweet, bright and alert, and is always interested in watching what's going on from her cage. Whenever someone comes into the room, she comes over to investigate and say hello, then props herself up so she can see everything. Dr. Harvey has refilled her meds (Albendazole and Ponazuril) and we'll continue with those since they have obviously helped. She's scheduled to see Dr. Harvey again on 6/7, so there may not be another update until after that. Veterinary care for Violet - and other needy bunnies like her - is made possible through donations from caring individuals. If you would like to help with Violet's medical expenses, please consider making a tax-deductible donation to Save A Bunny by clicking on the "Sponsor Violet" button at the bottom of this page. Violet was seen again today by Dr. Carolynn Harvey. Her condition has improved in the last couple of weeks, but she still has a long way to go. She's regained the use of her front legs and partial use of her left hind leg, but there is still hind end weakness, particularly in her right leg which causes her to collapse onto her right hip. She likes to lean against something to keep herself upright. Exactly what's causing this is unknown, and xrays were negative for skeletal damage. Dr. Harvey feels she may have a cerebellular problem, possibly from a blow to the head. It seems like her brain is not sending the correct messages to her right leg, although there is some reactive response. She continues to do well in her foster home. She's very active, bright and alert, and loves being the center of attention. Whenever she sees someone she immediately comes over for a nose rub, or better yet, to be cradled in your arms. She's even giving kisses! She's now being allowed supervised playtime and grazing in the grass in the backyard on a daily basis. She can really scoot around, even though she's pretty wobbly and tends to rest on her right hip. New photos of her playing outside are now posted. A big part of her recovery hinges on physical therapy while in her foster home. T-Touch, "bicycling" and gentle rocking movements are performed, along with massaging her right hind leg, hip, foot and toes. She's also receiving acupuncture from Dr. Harvey and chiropractic from Dr. Margaret Holiday. Her medication has been reduced to just Albendazole and Ponazuril; the Baytril and Metacam has been discontinued. This may be changed in the future. 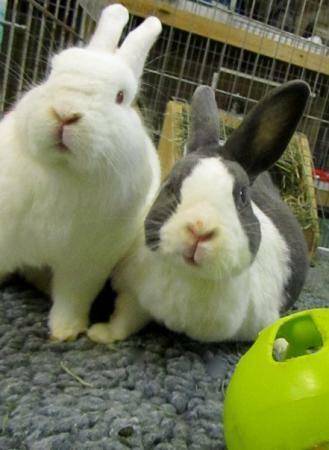 Violet is an extremely sweet and gentle bunny who deserves a chance at living a normal life. Everyone who's working with her is really pulling for her and "going the extra mile" to help her. Although her long-term prognosis is unknown, we're encouraged by her recent progress. However, she may never fully recover. But whatever happens, it's our hope and our goal that she'll eventually be able to be placed in a "forever" home, even if she needs some special care. She'll be a wonderful, loving companion. Violet's web page will be periodically updated with reports about her progress, so please bookmark it and check back often. Hello. My name is Violet and I am a beautiful girl-both inside and out. The reality is that my life has been very rough so far. And, my prognosis is not so good. But I am making every effort possible to enjoy my life and take each day at a time. Even though humans have been mean to mean I still love people. I love to be talked with, petted and sung to. Shoulder massages are my favorite. They help ease the stress in my little body. I am listed as a special needs rabbit because I have unknown neurological problems. It may be head trauma. It may be e. cunniculi, both, or something else. No one really knows, so I am being treated for e.cunniculi and given pain medication. I have balance problems and tend to fall over. I can right myself, but am unsteady on my feet. I like to prop myself up on the side of the cage and peek out on the world wondering what my life would be like if I was able to run and dance like other rabbits. I was part of a large group of rabbits dumped at Candlestick Point in San Francisco. Atticus and Ken Ohura at SaveABunny and Dandelion at Oakland Animal Services are part of that group. One rabbit from our group as humanely euthanized when she started having seizures at the city shelter. We were found in very bad condition. Exhausted, neglected, filthy and sneezy. Everyone else but me is doing very well. All of us are friendly and lovely rabbits very deserving of good homes. I am currently in a foster home getting the medical attention I require. What I also really need is for people to donate to help pay for my medical expenses. Making life and death decision based on finances is not easy for any group. Saving special needs rabbits is VERY expenses and takes a lot of time and resources. Some people may ask why SaveABunny would take in a sick bunny like me when there are so many healthy bunnies needing rescue. Well, each situation is different and SaveABunny believes that each rabbit deserves individual consideration. I am a very sweet, loving and brave girl that still wants to live, so I was saved. Please help SaveABunny provide me with the special care I need with a tax- deductible donation. I'm not to shy to ask and I know that all the money goes to help bunnies. Your support will also allow them to continue to help other special bunnies like me.